Edie Sedgwick, eat your heart out. 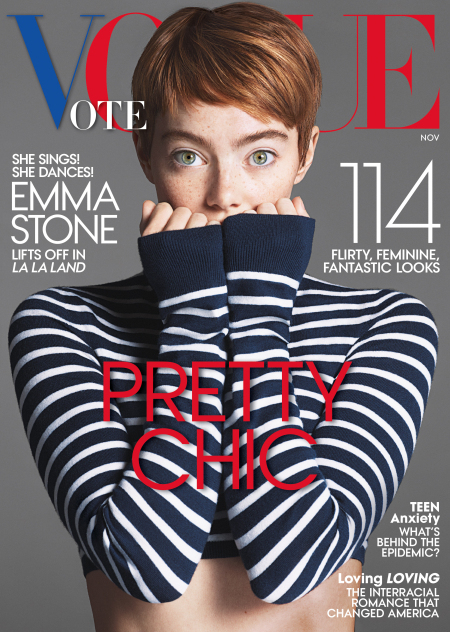 Emma Stone may be a hair-color chameleon, but she rarely switches up her signature style — unless she’s covering Vogue, of course! The La La Land actress, 27, graces the fashion bible&apos;s November 2016 cover rocking a short pixie wig. The cropped &apos;do, which is the shortest we&apos;ve ever seen on the star, makes her big green eyes pop all the more. The accompanying spread features Stone in a series of Old Hollywood–inspired shots. Her hair is styled into glossy curls, and she’s modeling retro threads, all of which complement the old-school feel of her upcoming musical film, which features frequent costar Ryan Gosling and is already winning rave reviews.